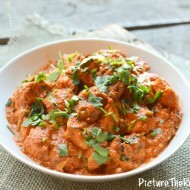 If you’re a fan of Indian food, Chicken Korma or Mughlai Chicken is probably on your list of dishes you like to order. 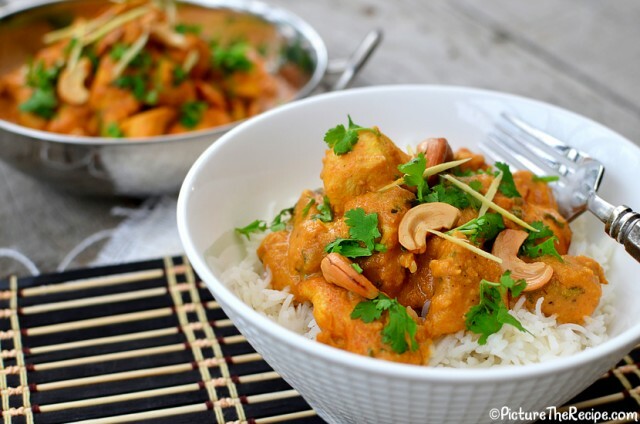 Best described as succulent chicken cooked in a silky sauce of onions, cashews and spices…this dish is nutty and flavorfully spicy without being fiery hot. The cashew paste and yogurt contribute to make the nutty, creamy texture of this gravy. Best served with Naan (see recipe here) or rice, this dish can easily be adapted for an equally exotic vegetarian version if you substitute the chicken for cauliflower, broccoli, potatoes, peppers and peas. 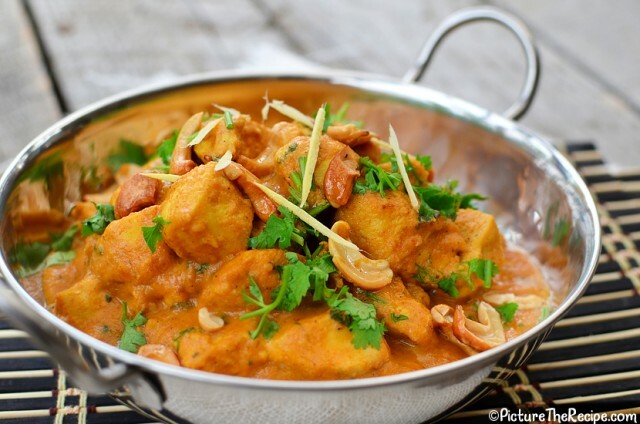 Succulent chicken cooked in a silky sauce of onions, cashews and spices. Your taste buds will thank you!! Cut the chicken breasts into 1 inch cubes or bite sized pieces. Peel and grate the garlic cloves and ginger into the chicken. Add 1/2 teaspoon turmeric powder, a teaspoon of salt and the juice of half a lemon to the chicken and mix well to coat all the chicken with the marinade. Refrigerate and let the chicken marinate for a minimum of 30 mins or more. While the chicken is marinating, peel and roughly chop the onions, de-stem and chop (for less heat de-seed) a hot chili pepper and add it along with the fennel seeds to a blender/food processor. Process the onion and chili pepper for a minute or 2 until it forms a smooth puree. Avoid using water to assist it, if possible. Set the puree aside in a bowl. In the same food processor (don't worry about washing it) process the cashew nuts with 3 tablespoons of plain yogurt. You may use a little water in this case to assist it to blend into a smooth paste. In a large pan melt some butter with a dash of oil to keep it from burning. Add the onion-chili paste and fry it for 6-7 minutes on medium until the onion has completely dried out and slowly starts releasing the oil. Be patient at this step as its crucial to get the rawness of the onion flavor out to form the base of this curry. Next add the whole spices (cinnamon stick and cardamom pods), paprika (optional) garam masala, coriander powder and tomato paste to the pad and fry the mixture for a minute or two. Add the cubed chicken breasts to the pan and sauté them with the spice mixture until the chicken is partially cooked. Add some water to form a sauce (depending on the consistency you'd like). Season with salt and about a tablespoon or 2 of sugar and simmer the chicken on medium-low heat until it is fully cooked. Once the chicken is cooked all the way through, reduce the heat to a low simmer and stir in the cashew-yogurt paste. This will thicken the sauce quite a bit. So to loosen the sauce, rinse the processor jar with a little bit of water and add it to the pan. Lastly stir in a couple spoons of heavy cream (optional) and a handful of freshly chopped cilantro. 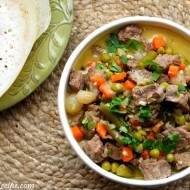 Garnish the dish with roasted cashews, cilantro and slivers of fresh ginger and serve hot with Naan or rice. I’ll definitely try the chicken korma. Today I actually got the time to make it. It was delicious! My son approved it.. He is my toughest critic. 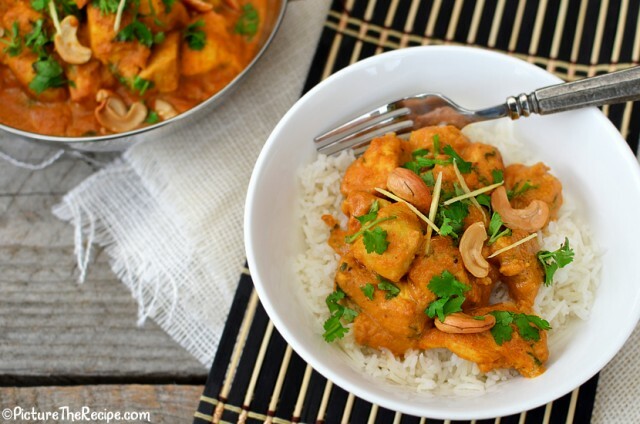 I had a spectacular cashew-based Korma in a restaurant several years ago, and since then have made at least five attempts with five different recipes to recreate it (or something comparably good). All failures–until now. This is truly superb–and the directions are spot on. I included the cream and would argue against it being optional. Thank you! Well cream and butter does make everything better in my books too! I just try to appease the health conscious with the optional bit 😉 . I’m very glad you found and liked the recipe! Looks lovely. 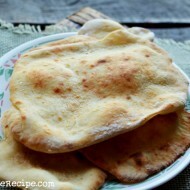 Planning to prepare this for dinner for my husband. I didn’t see when you put the cashew mixture to the dish. I guess we can add it after the chicken? OMG I can’t believe I left that out!! I will have to rectify it soon. Thanks for pointing it out. Yes…you add the cashew paste at the end there after you cook the chicken in the spices as you don’t want it sticking to the pan or burning. As to adding the cashews, you do spell it out in the written instructions at the base of the recipe–just not earlier with the illustrations. Hi, what does 11/2 onions mean? One and a Half. Sorry guess I forgot to add a space between the 1 and 1/2. 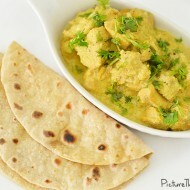 I’ve tried many chicken korma and yours is by farrr the best one! Thanks you so much !